The apartments are located 10 minutes away from the popular disco places (Cacao beach, Bedroom beach, etc. ), this part of the resort is quiet. There was a parking place which is great considering how crowded the resort is. For the price, the place is worth it. The place is very horrible and the staffs aren't kind. I will never stay there again. shouldn t be on booking.com! how we goona trust to booking.com!!! Рецепционистката беше мила и приветлива, дадоха ни ключ по-рано от предвиденото. Тихо и спокойно. Приветливый менеджер отеля. До пляжа 5 минут пешком. Szépen felújított szoba, kiváló elhelyezkedés csendes mégis a központhoz közel, kedves személyzet. 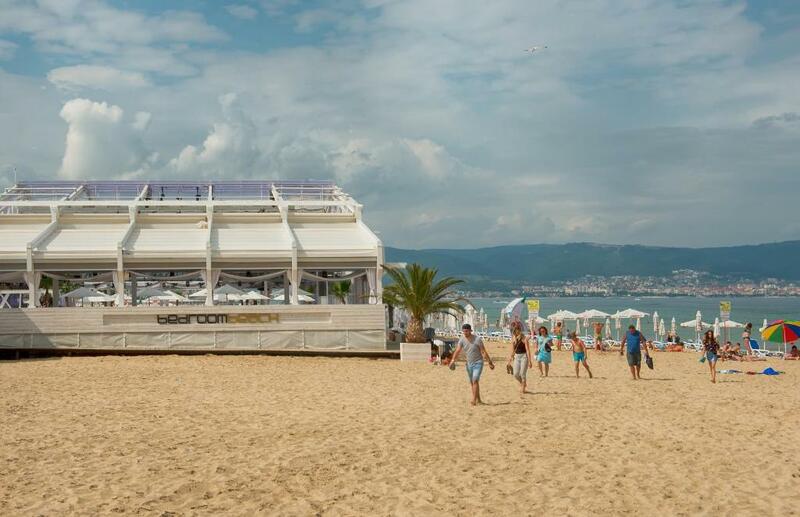 The comfortable and beautifully decorated Viva Apartments enjoy a convenient location in the south-western area of Sunny Beach, 1,000 feet from the beach. It offers spacious and stylish rooms. The nearby Cacao Beach features cozy romantic restaurants and bars set in picturesque dunes and surrounded by unspoiled nature. Only 150 feet from the Viva there is a bus stop with public transportation taking you to the towns of Nessebar and St. Vlas. The property can organize shuttle service to Varna and Burgas Airports upon request and at a surcharge, as well as car hire. The charming swimming pool and the water slide offer a great opportunity for summer fun. The sun terrace is exposed to the south-east guaranteeing sun all day long for those who enjoy sunbathing on the lounge chairs. 뀐 Located in the top-rated area in Sunny Beach, this property has an excellent location score of 8.0! When would you like to stay at Viva Apartments? With a balcony overlooking the pool, this air-conditioned studio has 1 large room with kitchen area, 1 double or 2 single beds, upholstered furniture. Cleaning services are provided on every seventh day. 1 additional bed is possible. 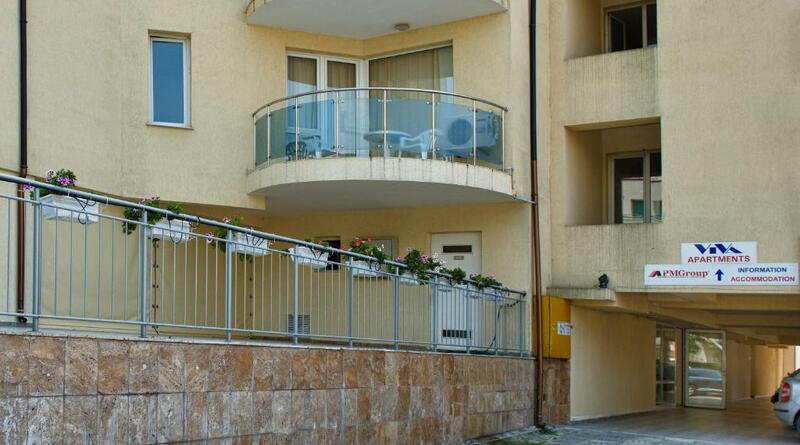 Spacious apartment with separate bedroom and living room, kitchenette, cable TV and a balcony overlooking the pool. Cleaning services are provided once a week. Larger apartment with 2 separate bedrooms and a living room with kitchenette. The balcony overlooks the pool. Cleaning services are provided once a week. Please note that two of the beds are folding beds. This studio features a cable TV, balcony and seating area. The comfortable and beautifully decorated Viva Apartments enjoy a convenient location in the south-western area of Sunny Beach, 300 meters from the beach. It offers spacious and stylish rooms. The nearby Cacao Beach boasts cozy romantic restaurants and bars set in picturesque dunes and surrounded by unspoilt nature. The charming swimming pool and the water slide offer a great opportunity for summer fun. The sun terrace is exposed to the south-east guaranteeing sun all day long for those who enjoy sunbathing on the lounge chairs. The café as well as the mini-market are convenient facilities. There is a small kitchenette in each studio where you can prepare light meals and coffee and tea. WiFi is available in some hotel rooms and costs BGN 2 per 24 hours. House Rules Viva Apartments takes special requests – add in the next step! Viva Apartments accepts these cards and reserves the right to temporarily hold an amount prior to arrival. Kindly note that free cleaning service is provided every 5 days. Please note that Viva Apartments' reception is open from 09:30 o'clock until 19:00 o'clock. The check-in and key collection take place at our reception desk. Please note that when booking more than 2 rooms, different policies and supplements may apply. Please inform Viva Apartments of your expected arrival time in advance. You can use the Special Requests box when booking, or contact the property directly using the contact details in your confirmation. The bed was too hard, the pillows too small, the armchairs too low and shabby. The kitchenette did not have a two ring cooker and only a microwave, limiting our cooking possibilities. Having to pay daily for wi-fi is ridiculous. Most places offer it free as part of the rental. The whole place is 20 years out of date. Price is for 2 days is 360 Bulgarian leva more bulgarian minimum montly weges, 1) there is no cleaning 2) Air conditions are 1980's model and no effect !!! You can feel 40C inside in rooms, 3)They are selling username and password for Internet Wifi but nobody don t say Wifi not work on 5th and 6th floors 4)Kitchen is awful, nothing useful! 5)Bathrooms are still in 1960's! Shower stall is broken nothing for cover! and smells very bad drain!! we can t take shower because only 2 minutes you can find hot water and you should be fast because of flooding!!!! 6)Beds are not comfortable ! The rooms did not look exactly as described. In one of the rooms, the shower in the bathroom was not working properly, the curtain was ripped and it was "repaired" with ducked tape. Part of the staff was not very polite.